NOT to be reproduced in any form without Permission of the Author ! For further study, see: Disk Contents and Boot Sector (and its Assembly code) pages. 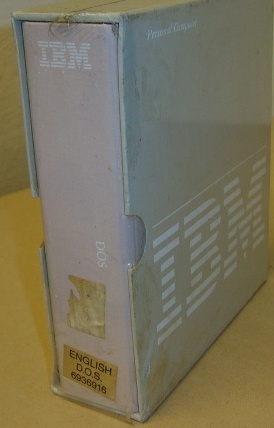 "Version 1.10 ©Copyright IBM Corp. 1981, 1982" (Photo©Daniel B. Sedory). IBM® Personal Computer DOS 1.10 was a revision of version 1.00 (see our description of the original version for general aspects of its creation). The latest file on the diskette has a date of May 7, 1982 (see Disk Contents), however, it's the opinion of many that this simply reflects the targeted release date by IBM® since all the files have this same exact date. The software was still being distributed on 160 KiB media (rather than the 180/360 KiB diskette sizes of DOS 2.00 or later); see Tech Notes for more information on the media. Thus, although we find a Batch program on the first diskette which could set-up DOS for French, German, Italian, Spanish, UK English or USA English*, we assume there were different production labels (and part numbers) for each of the different languages. IBM deleted all the original BASIC (*.BAS) files from the first diskette of these distributions to make room for the new setup and keyboard files on it, but remnants of those files can still be found in their original locations. The second diskette of these international sets, merely contains the 12 BASIC programs deleted from the first. *In this first attempt to make DOS available to users in other countries, we must note that the DOS commands and all their error messages were still in English. Manuals were translated into other languages and keyboard layouts were altered to display characters used only in other languages, but DOS itself remained English. This version added the /w parameter to the dir command, making it possible to view many more file names at once. The output from the chkdsk command was changed to specifically point out how many files were hidden from the user (in this case, 2). Thus, there was a total of 2 + 26 = 28 files on the version 1.10 (#6936669) distribution diskette. 1 Thanks to Wolfgang Kainz-Huber (of the ComputerMuseum München) for the data he provided about IBM's international version of PC DOS 1.10 in Germany. NOTE: This is still a work in progress! The following tutorial will provide both a copy of IBM Personal Computer DOS v 1.10 and teach you some things about using the free hex (and disk) editor HxD: Tutorial on extracting "Disk Images" from *.DIM Files.